A Kirk and Bradley handpainted needlepoint Holiday Balloon Holly. The design is handpainted onto 18 mesh mono Zweigart needlepoint canvas and measures 5.75" x 3.25". 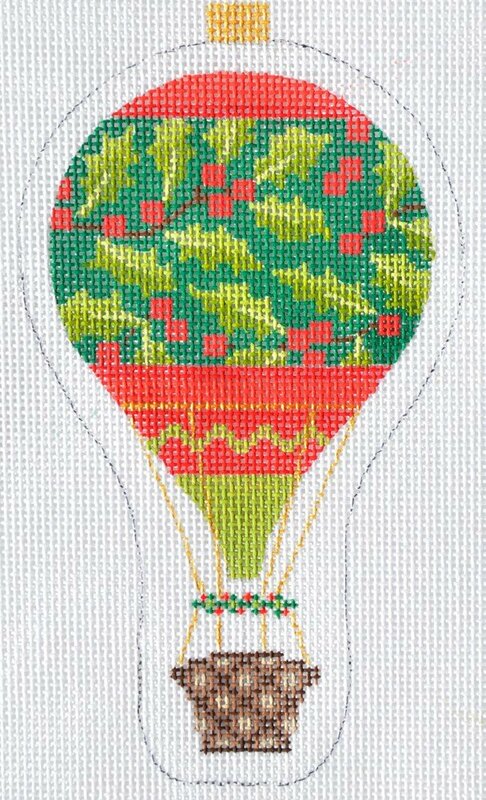 You can purchase this Kirk & Bradley holiday balloon needlepoint canvas with or without fibers. If you select cotton we will send DMC cotton floss or perle cotton. If you select wool we use Bella Lusso wool yarns; for silks we use Planet Earth Pepperpot Silks which are single ply for 18 mesh canvas. If you require stretcher bars we recommend a pair of 7" and a pair of 10" for this canvas.